This Wednesday 18 November the Australian and New Zealand Association of Medieval and Early Modern Studies (ANZAMEMS) is holding a Postgraduate Advanced Training Seminar (PATS) at the University of Canterbury. 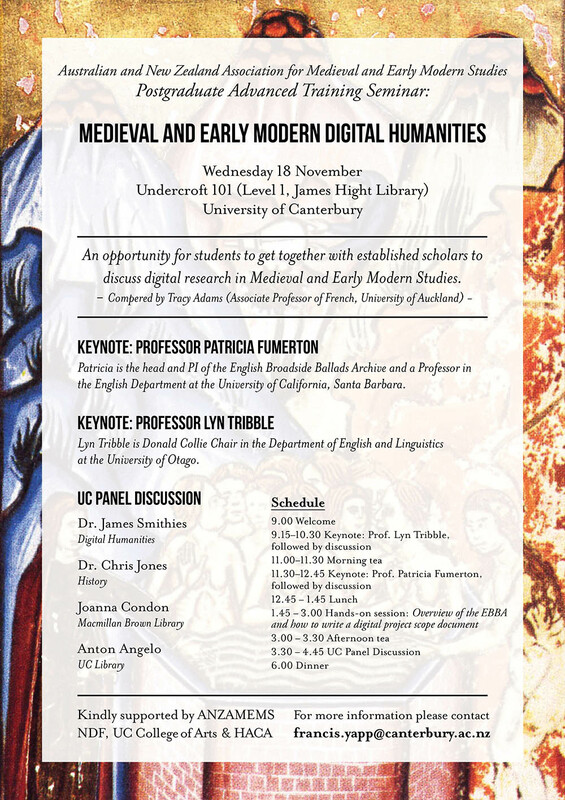 Organised in conjunction with UC’s Festival of Digital Humanities, the seminar will focus on digital research methods for scholars in Medieval and Early Modern history, literary studies, and musicology. The full-day event will take place in Undercroft 101. It will be compered by Tracy Adams (Associate Professor of French, University of Auckland), and feature keynote presentations by Prof. Patricia Fumerton (University of California Santa Barbara) and Prof. Lyn Tribble (University of Otago). There will also be a hands-on session. 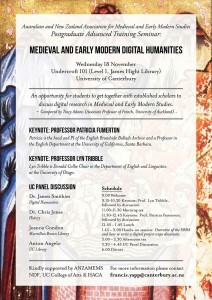 In this, Professor Fumerton will give an overview of the English Broadside Ballads Archive, a multi-million dollar project funded by the U.S. National Endowment for the Humanities that has been digitising, transcribing, reconstructing music and songs, and creating scholarship for many thousands of early modern ballads (the “ephemeral” new media of the time), and James Smithies (UC Digital Humanities) will guide participants on how to write a digital project scope document. The day will conclude with a panel discussion by James Smithies, Chris Jones (UC History), and Joanna Condon (Macmillan Brown Library), chaired by Anton Angelo (UC Library Research Repository). The PATS will bring 15 postgraduate students from around New Zealand and Australia to UC for the day. It will also be live-streamed on YouTube and simulcast in universities across Australasia. Archive versions will be available on this site afterwards.